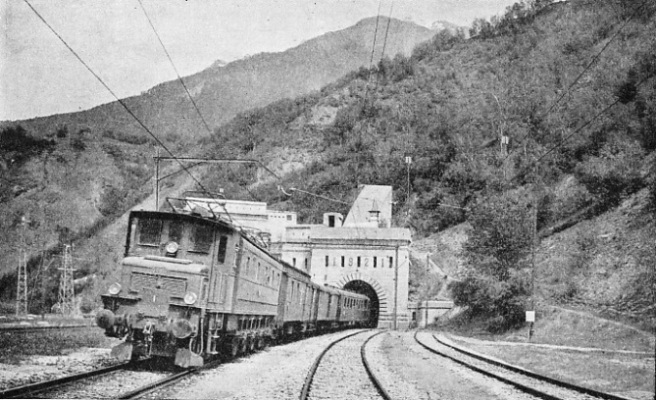 THE NORTH PORTAL of the Simplon as seen after the completion of the second tunnel in 1921. The double tunnel, the longest in the world - 12 miles 668 yards in length - was begun in 1898. 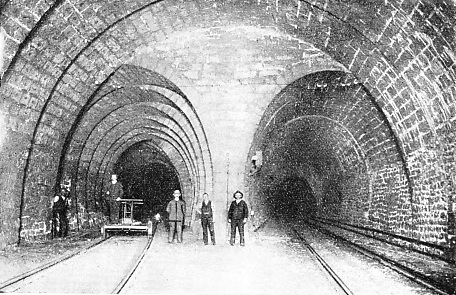 The first tunnel was opened in 1906. The second tunnel is parallel with the first, and the axes of the bores are some 55 feet apart. IN ancient times and in the Middle Ages the Simplon Pass was merely a narrow path, but its importance as a means of communication between France and Italy was considerable. Some vestiges have remained to testify of its use in Roman times, and from old chronicles of the thirteenth and fourteenth centuries we learn of the existence on the Simplon of a hospice, which still exists. But the road, if such it could be called, was far from adequate, nor was it suitable to carry heavy traffic. The Emperor Napoleon was the first to visualize the importance of the Simplon as one of Europe’s highways. He included the passage over the Simplon in his plans for the Italian campaign. In 1801, a year after the battle of Marengo, the construction of this great military road was begun. On its completion, four and a half years later, it had a length of thirty-seven miles. The first horse-drawn coach is officially recorded to have travelled over the pass in October, 1805. One hundred years later, within four months of this date, the running of the first passenger train on January 25, 1906, marked the completion of the Simplon Tunnel - the world’s longest tunnel, with a length of 12 miles 668 yards. The first serious project for the construction of a railway tunnel under the Simplon Pass dates from 1857, ten years after the completion of the first railway in Switzerland from Zurich to Baden. Several other plans were submitted from time to time by various syndicates formed for the purpose, and some of them by the then privately owned Swiss Railways. Among these projects was one for the construction over the Simplon of a rack railway on the Fell System, while another envisaged the construction of inclined planes with cable railways. In all, some thirty plans were submitted. As far back as 1889 the Swiss Government had invited the Italian Government to a conference at Berne, at which the basis for joint action was laid down. The Italian delegates insisted that the greater part of the tunnel should be laid on Italian territory and, in company with the representatives of the Swiss Federal Government, pressed for the submission of a concrete project. In 1890 a new conference was held, in which the famous firm of Gebruder Sulzer, of Winterthur, took a leading part, together with the contractors Brandt and Brandau. The project was examined by a special commission appointed by the Swiss Government, and composed of three civil engineers of European reputation, Sir Francis Fox, Professor G. Colombo of Milan, and Herr C. J. Wagner, Chief Engineer of the Austrian State Railways. The commission approved the project, both from a technical and from a financial standpoint. The estimated cost of construction was 69,500,000 francs (£2,780,000 gold). AT WORK ON THE TUNNEL HEADING. Brandt hydraulic drills were used during the construction of the Simplon Tunnel. The machines were equipped with four drills capable of driving holes from 4 to 5-in in diameter and 4 to 5 ft deep. The hollow drill cutters had to be changed as often as three hundred times daily; when new they were 24-in in length, and were used until they had worn to a length of 3 in. In the meantime the negotiations between the Swiss and Italian Governments had come to a satisfactory end by the conclusion of the Simplon Agreement of November, 1895, in Berne. Simultaneously the Jura-Simplon Railway Company obtained from the Italian Government the concession for the exploitation for ninety-nine years of the line on the Italian territory. After the purchase by the Swiss State of the Jura-Simplon Railway, the Swiss Government took over the company’s rights and obligations. With a view to the proper administration of all matters connected with the Simplon Tunnel, a permanent office was set up at Berne by the Swiss and Italian Governments. It is as well to bear in mind that the construction of the tunnel was begun in 1898. It is perhaps difficult for the younger generation to appreciate the fact that civil and mechanical engineering had not then reached the advanced stage of progress which it enjoys to-day. As far as engineering was concerned, the world was at a critical stage of transition, and still slowly and hesitatingly feeling its way in a labyrinth of new inventions and methods. Electricity was still in its infancy, petrol and Diesel motors were of almost primitive construction, and the chemistry of metals and metallurgy in general offered many unsolved problems. Such were the conditions in which the construction of the tunnel had to proceed. It was indeed a gigantic enterprise to bore through the mountain mass of the Alps, below snow-clad peaks rising to more than 4,500 ft above the level of the tunnel. Nothing similar had ever been attempted before. None of the three great tunnels then existing approached the Simplon in length. The St. Gothard Tunnel has a length of 9 miles 551 yards, the Mont Cenis Tunnel a length of 8 miles 832 yards, and the Arlberg Tunnel a length of 6 miles 648 yards. The experience gained in the construction of the St. Gothard Tunnel enabled the engineers to adopt an original method of construction, which included the boring of a secondary tunnel, parallel to the main one, of smaller section, and for the time being destined to fulfil the function of a service and ventilation tunnel. It was intended to widen the service tunnel to the normal section at a later date when traffic requirements should justify its use as a second railway tunnel. One condition of the contract was that the official request for the completion of the second tunnel should be made within four years of the completion of the first tunnel. In accordance with the original specifications the main tunnel had a section of 14 ft 9 in by 18 ft ½ in, while the service tunnel had a section of 10 ft 6 in by 8 ft ½ in. The principal purpose of the service tunnel was to accommodate the water-pipes which were to drive the perforators under pressure, and to cool the temperature in the main tunnel. It contained also the main discharge channel of the water encountered, and had the all-important function of acting as the main duct for the conveyance of fresh air, which was driven by powerful fans. The axes of the two tunnels were 55 ft 9 in distant from each other. At intervals of about 220 yards galleries connected the main and service tunnels. ENLARGING THE FIRST GALLERY. The main tunnel had to be constructed with a section 14 ft 9 in by 18 ft ½in, and the service tunnel with a section 10 ft 6 in by 8 ft ½-in Galleries at intervals of 220 yards connected the two tunnels. Exhaustive geological surveys had been carried out to establish as closely as possible the nature of the soil to be traversed. But, as geological science in those days had not reached its present state of advancement, the theoretical forecasts of the geologists were not always borne out by facts. In some instances this turned out to the advantage of the contractors, as, for example, when the supposed extent of hard rock came to an end much earlier than had been expected. In other instances, the sudden appearance of water indicated the premature presence of lime. One noteworthy instance of inaccurate forecasting deserves mention. According to the geologists the soil at the southern side of the tunnel was formed of compact hard gneiss over a distance of four and a half miles, and it was succeeded by lime formation and calcareous schists. In reality, the gneiss was in layer formation for over two and and a half miles, and was followed much earlier than expected by calcareous schists, which caused tremendous pressures. 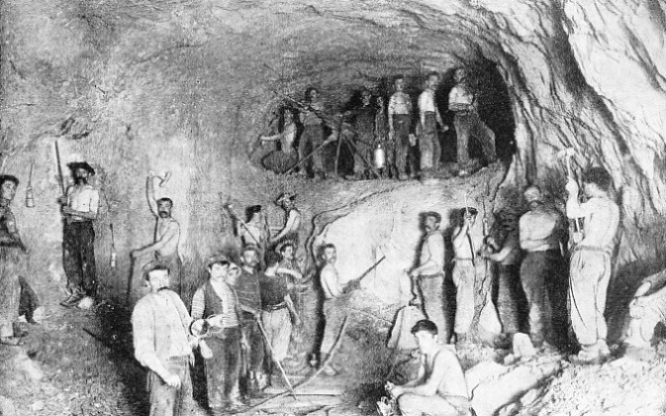 The lessons learned during the construction of the St. Gothard Tunnel, where over 800 men died from illness, had not been forgotten by the contractors; every possible precaution was taken by them to ensure the material and moral welfare of the thousands of men engaged upon the construction of the Simplon Tunnel. On the Swiss side an entire village was built at Naters near Brig, while on the Italian side a similar village was laid out at Balmalunesca. Large halls, divided into small cubicles, each containing a shower-bath, were built at either end of the tunnel. Previous experience in tunnelling had shown that personal cleanliness was of the utmost importance for maintaining health. Adjoining these cubicles was a hall for drying clothing. It was an imposing sight to see 1,000 or 1,500 working suits hanging from the ceiling, each with its number and connected with a long rope by which it was raised or lowered. On leaving work the drenched working kit was attached to the rope and pulled up to the ceiling. By the time the men returned to work for the next shift they found their working clothes perfectly dry. The efficiency of the sanitary services was such that the dreaded “miners’ disease”, to which so many fell victims in the St. Gothard Tunnel, did not appear during the construction of the Simplon Tunnel. At either entrance large yards were laid out which contained the machinery hall, with smithy and repair shops, cement and brick works, timber yards, stores, stables, depots for explosives, and so forth. The yard at the north entrance covered an area of 195,000 sq ft, that at the south entrance an area of 98,000 sq ft.
For the purpose of ensuring a permanent water supply, special aqueducts were constructed on either side. On the north side the water was derived from the River Rhone, and conveyed by a reinforced concrete canal, two miles long, to a place called Massaboden, where the water entered the pipe-line. The pipe-line had a length of 4,920 ft. The difference in level between the upper and lower ends of the pipe-line was 146 ft. The hydraulic power thus obtained by the turbines was 2,230 hp. On the southern side similar arrangements were made. The water was taken from the River Diveria, and conveyed through a pipe-line two and a half miles long over a fall of 456 ft to the turbines, which had an output of 1,950 hp. These special provisions for the supply of water were necessary because water was the principal motive power during the construction of the tunnel. It served for driving the hydraulic drills, for the acetylene illumination of the headings, for the cooling of the inside temperature, for driving the pumping installations, and for the compression of the air for the locomotives. 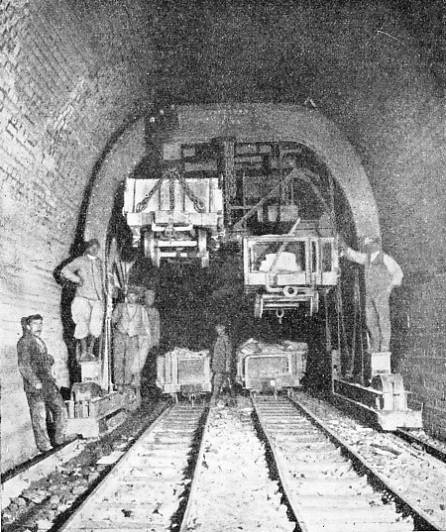 It must be remembered that at the time the tunnel was built not even electrically-driven pneumatic hammers and drills were known, nor was electric illumination sufficiently advanced to allow of its use. The hydraulic hammers and drills had been specially designed by the contractors and were known as the Brandt hydraulic drills. They were machines which vaguely resembled a piece of mountain artillery. THE FORMIDABLE MOUNTAIN BARRIER through which the Simplon Tunnel had to be driven can be seen from this remarkable picture. The arrow on the left of the illustration denotes the northern entrance of the Simplon Tunnel. In the foreground is the station of Brig. 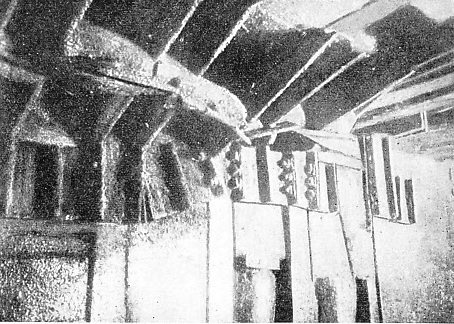 The drills were mounted on a 12-in column, which was wedged with its ends against the side walls of the tunnels. This column acted as a hydraulic press. It was mounted on a low truck to facilitate its being moved towards or withdrawn from the advance heading as the occasion demanded. The drill itself consisted of a large cylinder with a piston which advanced under the pressure of the water, the hollow bits being screwed to the mandril at its forward end. The pistons had a diameter of 1⅞ in and stroke of 2⅜ in. The rotary movement of the drill was obtained by two small hydraulic motors mounted at the sides of the main cylinder. One machine was provided with four drills, and was capable of driving, in different directions, four holes of from 4 to 5-in diameter and to a depth of 4 to 5 ft. After the four large holes had been drilled eight smaller ones were bored. Generally the twelve holes required two and a half hours. The holes were then loaded with dynamite and exploded. In normal conditions eight or nine applications were made in twenty-four hours. The hollow drill cutters had diameters varying from 2¾ to 3½ in. They had to be changed continuously, often as much as 300-400 times a day. The changing took only a few seconds, and the used bits were brought to the smithy, where the worn tubular bits were renovated and new ones made. The cutters when new had a length of 24-in and they were used over and over again until this length was reduced to a matter of 3-in or so. Progress of the work was considerably delayed by unforeseen factors, which at last endangered matters to such an extent that operations had to be suspended at a certain point, and it seemed as if the completion of the tunnel would have to be abandoned. The four great obstacles were high temperatures, pressure of the soil, inundations, and hot springs. From the experience gained during the construction of the St. Gothard Tunnel, the geological nature of which appeared similar to that of the Simplon, it was thought that the maximum temperature encountered would be 107° F. In reality it reached on the Italian side 115° and on the Swiss side over 129° F. Special provisions had therefore to be made to render the temperatures endurable, although the contractors were unable to keep the temperature down to the 77° stipulated in the contract. The ventilation air conveyed through the service tunnel was not sufficient to reduce the temperature, and it became necessary to lay within the service tunnel a pipe-line for the conveyance of cold water. The pipe-line was insulated to maintain the temperature of the water which was under pressure. 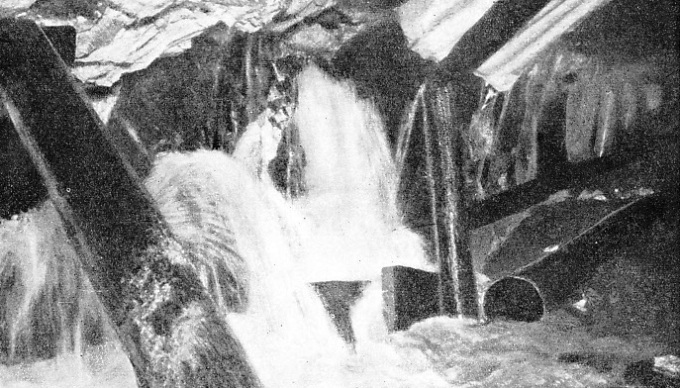 The pipes were brought through the cross connecting galleries between the two tunnels into the main tunnel, and the rocks were continuously sprayed with the cold water by means of a series of sprayers. At the same time, the ventilation air was driven through sheets of water sprays. THE SIMPLON TUNNEL YESTERDAY. This interesting illustration shows the southern entrance as it appeared shortly before completion in 1906. Beside the main portal can be seen the service tunnel, later widened and converted to a second tunnel. 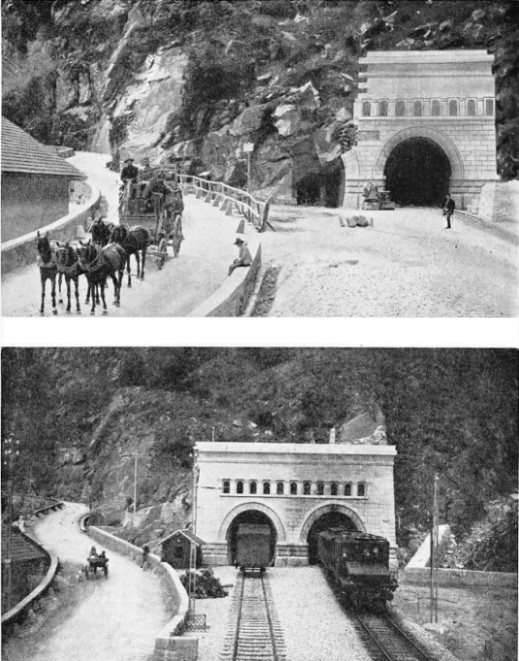 On the left is the famous Simplon road, with a fast coach of the type used to carry the mails before the tunnel came into use. THE SIMPLON TUNNEL TO-DAY makes possible the rapid rail services between the two main western capitals, London and Paris, and the south-eastern cities of Europe. The above illustration shows an electric express emerging from the south portal of the Simplon near Iselle. An unusually heavy pressure of soil was encountered on the Italian side, where, at point 4422, a pocket of micaceous lime schist was met. This is about the worst kind of soil imaginable, its consistency being that of a soft clay, which exerts pressure in all directions. The usual method of drilling and blasting could not be adopted, as the material was too soft. The pocket had, therefore, to be attacked by hand and immediately shored up. But the wooden supports were not strong enough to resist the enormous pressure and broke in pieces. The strongest oak beams, with a section of 20 in by 20 in were distorted, although their height was only 6½ ft.
After various experiments, a system was successfully adopted which consisted in the use of iron frames constructed of channel girders 16 in deep, 6⅛ in wide across the flange, and ⅝-in thick in the web. The frames had a total width of 8 ft 2 in, and a height of 9 ft 2 in; and their weight was 2,640 lb. They were placed at a distance of 20 in from one another. Each beam was sandwiched between two heavy baulks of timber, thus increasing the thickness three times. Although the length of the pocket was only 138 ft, seven months were needed to negotiate it; in normal conditions it would have required only five days’ work. The construction of this length of tunnel is particularly interesting because of the unusual method adopted. After the rectangular iron framework described above had been placed in position over the whole length, it formed a rectangular tube. To excavate this to the full section of the tunnel, side shafts were excavated over short distances on one side of the uprights and immediately lined with strong oak props. Then the same was done on , the other side. In this way it was possible to get at the soil immediately below the bottom horizontal iron girder of the framework. This soil was excavated, and the centre part corresponding to the horizontal girder was completed with strong masonry work, which was continued on either side until it reached the level of the bottom girder. The thickness of this inverted arch varied from 8 ft 2½ in to 9 ft 2 in. After completion of the inverted arch the section at the sides of the iron uprights was excavated and the masonry work was completed, beginning from the outer edges as far as the springing of the arch. DURING THE CONSTRUCTION of the second tunnel special overhead travelling cranes were used to transport the excavated rock from the narrow-gauge service line within the tunnel to the normal gauge line in the completed section. These gantry cranes were electrically operated. The whole work was done simultaneously at various points at a suitable distance from one another. This work required a whole year, and progress was delayed also through the continuous stoppages of work due to the many service trains which passed through the iron tunnel. The completion of this length took another six months, so that in all over two years were required for the construction of 138 ft of tunnel. Delays were caused also by the enormous quantities of water encountered. During the late summer of 1900 a fall of temperature in the heading from 91° to 79° had been observed between points 2400 and 3800, distant respectively 2624 and 4156 yards from the south portal. It was not till May, 1901, that the explanation of this phenomenon was given. At point 3824 the advance heading encountered a heavy influx of water, which rushed through the bore-holes at the rate of seventy-five gallons per minute. The heading had penetrated into a zone heavily impregnated with water and extending over 670 yards. It was found that the tunnel had been bored 2,000 ft below the surface of an immense reservoir of water. At point 3891 the roof of the advance heading split under the pressure of water, which poured in at the rate of 2,500 gallons per minute. Fortunately this huge quantity diminished later until it reached twenty gallons per minute. At point 4364 another inundation occurred, this time in the service tunnel. The amount of water was 3,000 gallons a minute. The worst influx of water occurred at point 4397. It became necessary to block the heading with sandbags, so as to form a reservoir to oppose the onrush of water. This method was successful, and permitted the boring of a. by-pass from point 4380 above that length of the tunnel which was under water. In this way the critical point 4397 was passed over, and the by-pass tunnel brought to the normal tunnel level from where point 4397-99 was again attacked. The enormous quantities of water discharged through a specially built channel by the force of gravity, as the gradient on the southern slope was about 1 in 145. Hot springs encountered on either slope of the tunnel caused serious and repeated stoppages. The temperature of these hot springs varied between 113° and 122°F, and work became impossible because of the hot air in the headings, which rose to 104°. The hot springs met with on the southern slope at point 4500 were particularly serious. The heading was flooded over a length of 900 yards, and, to proceed with the work, a cross-channel between the main and the service tunnel was constructed to convey the hot waters over the shortest distance into the service tunnel canal. The cross-channel was covered in with thick timber so as to prevent the air from being heated by the hot water. The air - cooling installation was brought up to this point, and the cold water which had caused such delay at point 4397 was harnessed in a cement duct, and utilized to cool the hot air in the heading. For this purpose a large pumping installation was set up in a cross-tunnel and connected with a Pelton turbine. Later, one of the locomotives used in the machinery hall was brought down to increase the pumping capacity. On the northern slope several hot water springs were encountered, and similar arrangements were made for coping with them. On the northern side matters were still more difficult, as the tunnel was bored on an up gradient, the highest point of which was at point 9594. From here to the south portal the tunnel was laid on a down gradient of 1 in 145. During the work on the down gradient the waters had to be pumped up to the culminating point, as there was as yet no natural outlet available to the south. Matters proceeded satisfactorily up to point 10150, where hot-water springs were encountered which inundated the heading over a length of 550 ft. This water was pumped up to the highest point by a special pumping installation mounted upon trolleys. Shortly beyond this, at point 10378, a new inrush of hot water occurred, at the rate of 500 gallons a minute. Unfortunately, the machinery plants on the northern slope came to a standstill because of a mountain slide above the intake of the power station, which was put out of function. Pumping and ventilating machinery driven by the current produced there became idle, and the whole work on the northern side had to be abandoned. Powerful steel doors set into heavy masonry were erected near the cross gallery which connected the main tunnel with the service tunnel, and the water accumulated in the tract between the advance headings in both tunnels and the two steel doors. AN INUNDATION of the tunnel workings caused by the incursion of some cold springs. At one point water poured in at 3,000 gallons a minute and threatened the enterprise. A by-pass tunnel had to be built round the affected area. In another place hot springs were encountered, the temperature of which varied between 113 and 122 degrees Fahrenheit. The boring of the tunnel was continued from the south side only, and on February 24, 1905, the last cartridge was exploded, and the hot water rushed from the northern side through the opening. Communication was thus established after 2,392 working days. The average progress had therefore been over 27 ft per day. The completion of the tunnel required almost a year, and the official opening was on January 25, 1906. The world’s longest tunnel, and one of the world’s greatest pieces of civil engineering, was completed, a lasting tribute to Swiss engineering. As mentioned above, the Jura-Simplon Railway was later taken over by the Swiss Government. 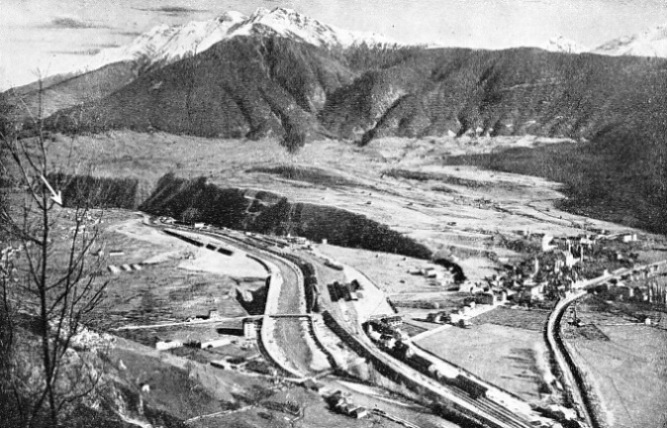 Before the first tunnel had been completed the Chief Engineer of the Simplon Division of the Federal Railways drew the attention of headquarters to the necessity of completing the second tunnel to assure the safety of the masonry work in the first tunnel. THE FIRST TUNNEL contained a station about half-way. The purpose of this station was tc permit the trains to pass, as the tunnel was only single track. A Commission set up by the Administration of the Federal Railways concluded in its report that the systematic completion of the service tunnel was unavoidable, but that it would be advisable to proceed at once with the widening of the service tunnel instead of undertaking merely its completion. Sooner or later, the second tunnel would be required for traffic. The Federal Railways therefore called on Messrs. Brandt, the contractors, to build the second tunnel on the same scale as the first. In view of the altered conditions the firm obtained release from its contract, and the Swiss Federal Railways undertook the work themselves. They created for the purpose a special construction department, on which devolved the responsibility for the safety of the first and the completion of the second tunnel. Before the work could be begun it was necessary to put the plant of the late contractors, Messrs. Brandt, into working order and to modernize it. Since the first tunnel was started, engineering had made great progress. New and more economical machines were available which made the scrapping of old ones imperative. Nearly all the boring and drilling plants were replaced by pneumatic tools, new at that time, which were capable of six to ten times as much work as the hydraulic Brandt machines. The transport of the excavated material from the advance headings of the first tunnel had been effected with compressed-air locomotives, while on the completed tracks and in the open, steam locomotives had been used. Conditions in the second tunnel, however, made the use of the latter impossible, and it became necessary to use a new and more powerful type of compressed-air locomotive. TREMENDOUS PRESSURE. The deformation of the steel lining of the Simplon Tunnel through the tremendous pressure of wet soil is clearly shown in this picture of a section of the roof. The old machinery hall was retained and equipped with some modern machine tools, and new carpenter shops were erected. Electric power was supplied by the electricity supply companies at Brig and Iselle respectively, and special transformer stations of 1,600 kVA and 1,800 kVA respectively were erected to step-down the high-tension current to the requisite low voltage. The old locomotives used for transport within the tunnel were replaced by new and more powerful engines. Special provisions tor the removal of the excavated material had to be made on the northern entrance, where it would have been impossible to allow the narrow-gauge service line to cross the main line. The experience gained during the construction of the first tunnel greatly facilitated the whole work, and even the worst sections were negotiated according to time-table. Thus, for instance, precautions were taken to deal successfully with the section between points 4452-4504, where the tremendous pressure had caused trouble in the first tunnel. The war of 1914-18 interfered with the work. 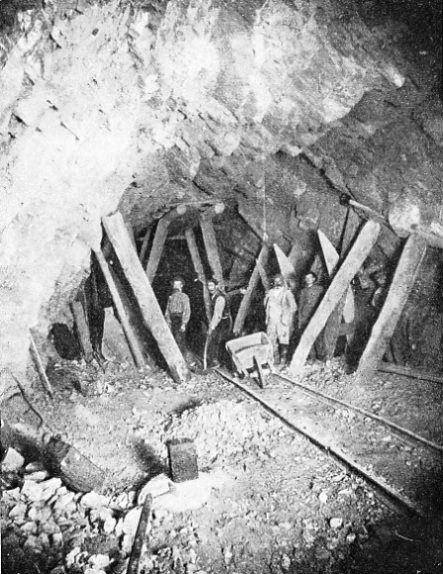 Work was stopped in March 1917 on the southern side of the tunnel. By this time the tunnel had been completed for a distance of five miles from the south portal. On the northern slope work progressed slowly, but it was possible to continue the work till July 1918, when only 1,900 yards remained to be completed. Work was resumed again in December 1919, and completed on December 4, 1921. You can read more on “The Channel Tunnel” and “Tunnelling Against Time” on this website.